My history with Eddie Vedder’s music goes way back. The night before I had my accident in 1996 I listened to Off He Goes, sobbing for a life I was leaving behind in a small town in South Africa. In that moment, I had no idea of how my life would really change the following morning, in the few seconds, filled with crashing glass and crunching metal and breaking thorn trees followed by the hot still silence of a clear Karoo day, it took to put me in a wheelchair. That was not the only moment in my life that had a PJ track attached to it – there were many moments, from gentle, quiet ones to gleeful ones to heartbroken, sad ones, that had a range of their tracks attached, and still do. And there’ll be more to come. And that’s the back story as to why this trip to Sicily from Cape Town is a dream. I’ve been wanting to see Eddie Vedder for years. Many, many years. When I saw the Florence festival announced, I hesitated for a split second, and booked, living by the cliched (but true) ‘Life is short’. Then Sicily was announced and the plan changed. Sicily! In an Ancient Greek ruin? No brainer. And so it came to be that last night, in an amphitheatre dating back to the early Seventh Century BC (BC! 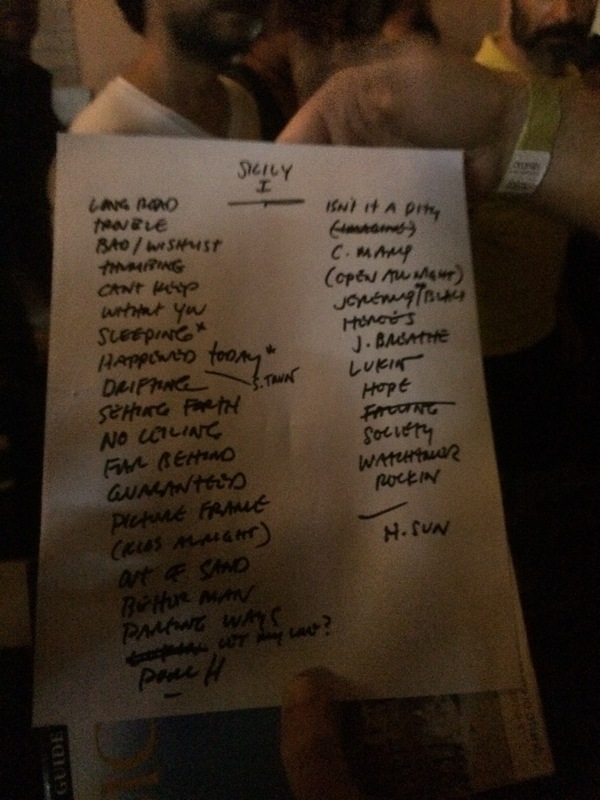 ), I saw Eddie Vedder, live. It may well have been the best night of my life. 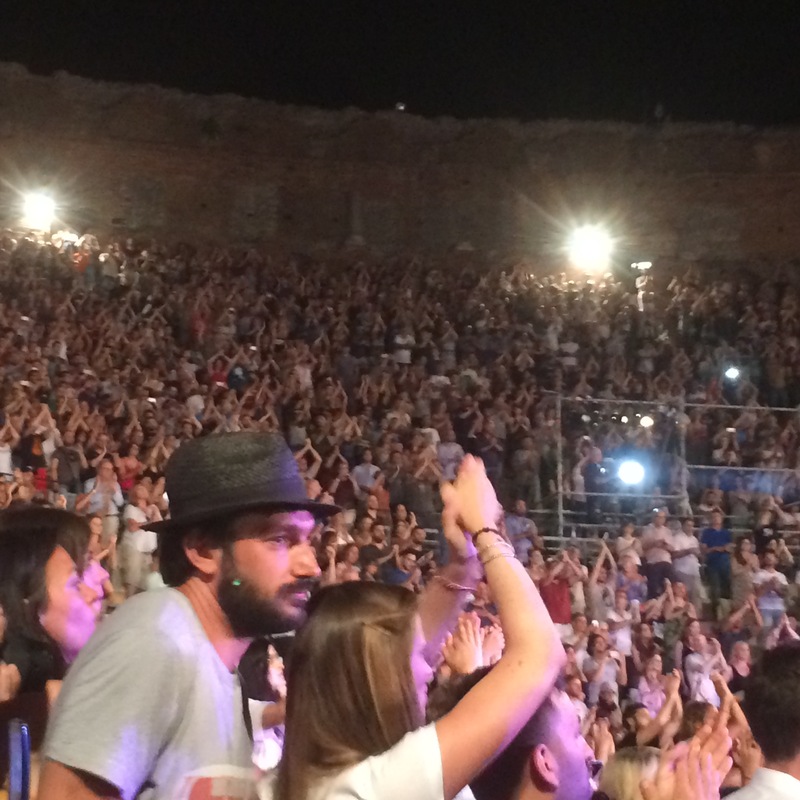 The crowd roared – echoes of gladiator fights of years ago – as Eddie Vedder walked on stage, 25 m from me. As he picked up his guitar and sang those first few words, I dissolved, grinning like a loon, my lips quivered and tears overflowed. That voice. The one I’ve listened to a thousand times, on tapes, on CDs, on YouTube videos … live. For two-and-a-half hours he sang, no break. Just Breathe, Society, Without You, the best rendition of Jeremy, with the string quartet, the list went on and the crowd went wild and my lungs scrunched up and my heart expanded and I was enthralled. And an R.E.M. track, with a Michael Stipe in Berlin story attached – my second favourite band – swoon! During Jeremy he came into the crowd, shaking hands, hugging people, coming closer to us, until he was right there, so close I could’ve touched him, but I was totally frozen in awe. Leigh put out her hand, he shook it. And then he hugged Federica, before going back to the stage. We all cried, like teen fans, but much more sophisticated (of course). Pigeons flapped from rampart to rampart, momentarily lit by the stage lights, and bats flitted across the sky. A heavily pregnant woman in a white dress walked up and down in one of the top tiers, beautifully lit and looking like a Greek goddess. The whole thing was surreal. And Eddie Vedder sang and chatted and shared his wine and congratulated the newly engaged couple and brought his daughters and wife on stage and it just all felt so incredibly lovely. And, dare I say it again? That voice. 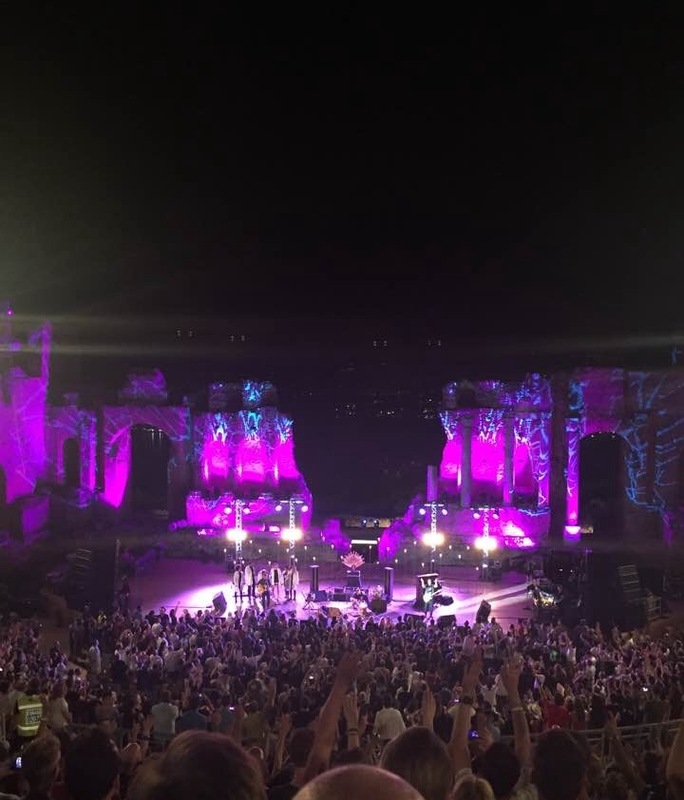 Fascinating fact of the day: Eddie Vedder with a ukulele and Glen Hansard can sing, without microphones, in that ancient amphitheatre, and the sound is perfect and the audience will be hushed in wonder and it will be magical. Tonight, I’m lucky enough to go again. Hold thumbs for Off He Goes, please. This entry was posted in Arts, Music & Culture, Travel & Exploring and tagged Eddie Vedder, Pearl Jam, Sicily, Travel. Bookmark the permalink. This was a great read. I’ve never seen Eddie perform solo, but it was an absolute dream come true seeing Pearl Jam at last in the fall of 2009. It seems that he always manages to to make shows personal, and really draw people in. I’ve seen a lot of shows, but that show I remember like it was yesterday. They are all very special artists and performers. I’m glad you got to have a really singular experience with this show.